Hello everybody and a warm welcome to my first ever blog story! Today, I want to share with you (and in the future too) ONE (at a time) of many of my various stories and thoughts regarding my life experiences with my own three children as a passionate, enthused and very proud fulltime mum. Also, I will be talking about my second profession as a studied freelance fulltime artist. Last, but not least, I will share my feelings and thoughts with you about my third profession as a (rescue) pet-keeper based on my great love for animals in general and also in particular for our own and beloved pets. They are always well looked after - their health, happiness and general wellbeing, all on our own, but non-sponsored pet-sanctuary. This, our private and non-sponsored pet-sanctuary was started by us in 1995, when our first two dogs accidentally have produced a litter of eleven pups. Together with their parents we have kept them all, as a result having been forced to spend most of our livelihood-money for their welfare and happiness. So far, during the following years we have taken in ten more rescue dogs from other people in our “for ever” care, because we have never given away one of our beloved (rescue) pets, but kept them with us all the years, up to their old age and natural death. To that time my youngest son was about fifteen years of age and always busy at school and at home too, but mainly in front of his computer screen and my husband of more than three decades was also very busy with the obligations to his very own “retirement hobbies”. Consequently, I needed each day about five (or more ) hours to feed, brush or bathe regularly - one after one - our then thirteen, then eighteen (later twenty-three) dogs, as well as cleaning their bowls and kennels and/or changing their bed-mats and so on. However, at least my son found the time to help me with the daily exercising of all our dogs and for that we needed additionally two hours extra per day. A couple of years later he has helped me permanently, despite his studies at high school and later at university. The last six years, he has taken over most of the duties connected with our pet-sanctuary to disburden me, because my health isn’t anymore the best like it was all the years before! 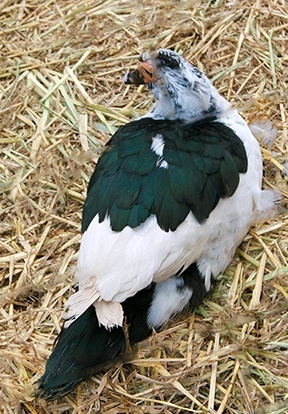 However, my first story today is not about our pet-sanctuary and its residents, but about my pet Muscovy drake, called “Pancake” and his recovery, following his poisoning after having eaten a mouse that had ingested rat poison. Because of our many animals, we live in a rural area and news stories in the local papers of “mouse plagues” are common. We keep the mouse population on our property under control with over-the-counter rat poison. What we didn’t know was just how awful the poison is – not only does it take days to kill the pitiable mice and rats, but it generally also kills the animals that eat the dead or dying rodents. We found this out after my favourite pet drake “Pancake” has started acting sluggish and developed alarming, deeply red swellings on and in his throat, face and tongue. After this surprising discovery, we immediately took him to the local vet, who had his cages filled with animals (mostly cats) that had been poisoned from eating dying mice or rats. To complete the vet’s thorough inspection, he has asked us to turn our very tame pet-drake on his back and this happened without any problems. Then, the vet injected the vitamin K1 into his wing and additionally has given us a sizeable quantity of liquid vitamin K1 to take home and feed to him twice a day for four weeks. Fortunately, on the fourth day he began showing a good appetite again and therefore had kept his weight of about seven kilograms. Luckily, the tremendous swelling in his throat, as well tongue and face was gone after a few days, but a hard knot had remained under his bill, which didn’t bother him at all. Anyway, we were relieved when it was gone for good after a few weeks of daily observation. Despite all those unexpected and for him new experiences, he stayed calm and tame. Also, he was strong and alert during the time of his recovery, even though still a bit sluggish and sleeping a lot. However, I have to mention too that it was a daily hard piece of work to give him the ‘liquid food” and medicine, because he was never prepared to properly swallow it. In fact, he was very good in fooling my son and me, by keeping the (good tasting) medicine in his bill without swallowing it, as long as we held him, with his closed beak upwards. Unfortunately, in the same moment we let him go, he heftily shook his head so that at least half of the medicine was spread around the room. Therefore, we had to give him still more of the medicine in the hope that he would get anyway the quantity he needs to get well again. This meant for us buying additional expensive medicine and also feeding him three times as much each time. Fortunately, he was the only one of all of our pets that was unlucky enough to have swallowed a poisoned mouse. That’s only possible, because some of our twenty-three (rescue) mix-breed dogs are housed in licensed, secure dog kennels, the other ones are living with us in the house as beloved four-legged family- and pack members. In addition, two of our white and neutered Angora tom-cats are also living with us in the house for nearly two decades and our sixteen other old cats enjoy too a protected life in their licensed cattery. Nonetheless, we laid rat poison in places only rodents can reach. Our aged cats are even too lazy to try and catch the mice comfortably eating from their good (and expensive) cat-food and two of our large male dogs are allowing rats to sleep with them together on their beds – as welcomed playmates and therefore as unharmed “pets for dogs”! That means, in twenty years (of using rat poison) we never had our cats or dogs show interest in eating any rodents, so the danger of them getting poisoned was virtually zero. By the way, it is not understandable that humans were able to manage in the year 1969 a landing on the moon, but still are unable to develop a “safe” over-the-counter poison for rodents, which does not cause such a hurtful, slow death for them and is at the same time harmless enough to other animals unlucky to have swallowed the poisoned gnawers. Below are some nice photos, made by me during “Pancake’s” recovery. At the time of his recovery, we kept him protected and warm overnight on soft wool blankets in a large, but enclosed, secured space in the open laundry of the comfortably heated house. As a water bird, of course, “Pancake” produced a hell of a mess every day again in our laundry and I have had to change and to wash permanently his bedding to keep him dry and warm. On the warmer and sunny days, he was brought outside for enjoying rumbling and shuffling around under the trees and bushes in the secured, though highly fenced front yard. On those occasions he has been regularly visited by his curious, but very bossy fellow drakes, always seeking a “sporty” fight with him through the fence. In doing so, they were silly enough to put their heads and necks through the wire nettings. Therewith, they have given “Pancake” a great opportunity to take some sort of revenge for all the discomfitures he received, when he was still together with them in the secured and highly fenced backyard! So, his favourite and most pleasant game was to get their attention by waddling up and down behind the separating fence to provoke them into offering their unprotected heads and necks, reaching through the fence meshes in the hope of catching him in some way. No doubt, this was - for “Pancake’s” understanding - the most fascinating “picture perfect” scene to enjoy! In fact, their unprotected heads looked like pearls of unique jewellery, neatly and closely positioned, just right for picking each of them without being in danger of getting harmed himself. Yippee, this wonderful sight was indeed, the greatest pleasure for the good-natured “Pancake”, since the tables have turned on him always having been bossed around, especially by those very same drakes. Now, he gladly used the chance to pluck here and there a few feathers from their heads and drumming a bit with his bill on their hissing bills, ineffectively opened in defence and defiance. In case his previous perpetrators have not been quick enough in pulling back their heads again, “Pancake” has done his best to teach them a lesson, to not take on those less fortunate who are unable to be self-confident enough to stand up for themselves. In the end, each game becomes boring if repeated too often, so that’s why we have offered “Pancake” a very quiet female companion - the peaceful duck with the exclamation mark on her back and good to see on the photo below. No, no, it’s not made with “PhotoShop”, but natural. 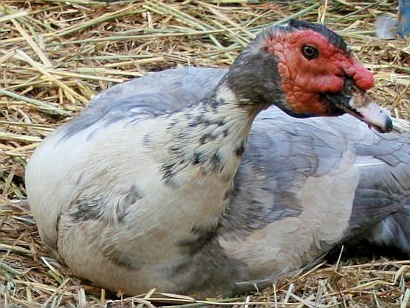 This old, but healthy girl is now about twenty-one years of age and still interested in good food and her lively surroundings of pretty ducks from each generation her genes have been partly down to. 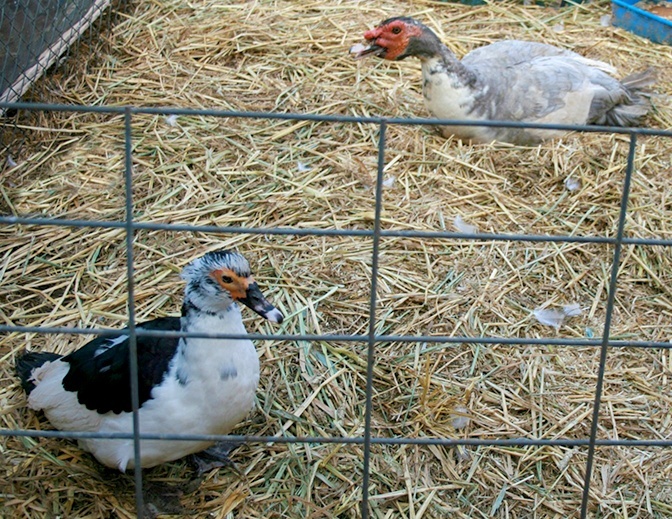 One day in 1995, when we still lived in another state on a farm, because of our dog - and cat-sanctuary, she flew to us from probably another farm and stayed with our other ducks to this day. At that time, when I had shown her photo around in our neighbourhood, nobody had missed her or knew where she belonged to, even though she must have already been two or probably three years of age. PS: By the way, the first and last time I have eaten a bit of duck-meat was in a hotel’s dining room in 1974!